Texture. It is so important. In design, it’s the element that brings the POP! and the WOW! factor to your space. Like the humor in a speech or the color in a drawing. Without texture, your space would ultimately be dull and flat. An anthropological study in plaster, by John Snogren. 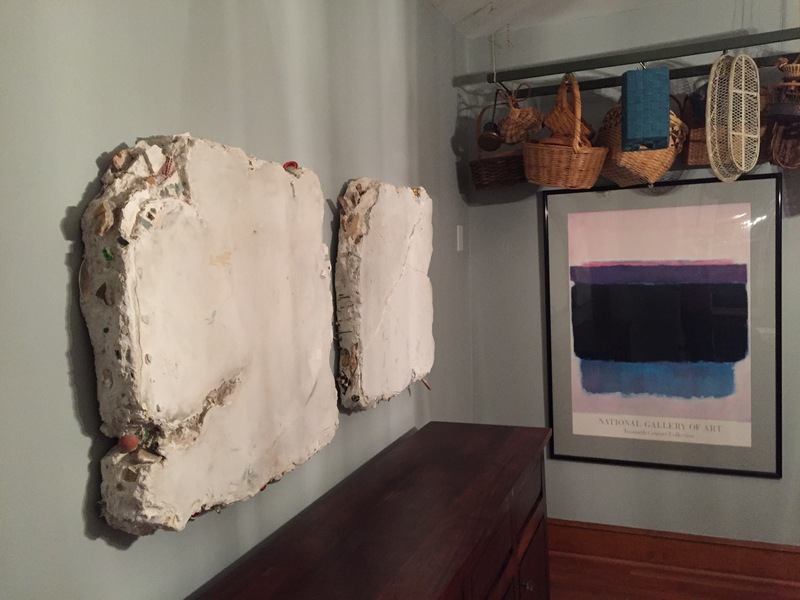 These pieces hanging in my dining room serve as a reminder that art is a living idea, meant to stir up discussion and provoke thought. 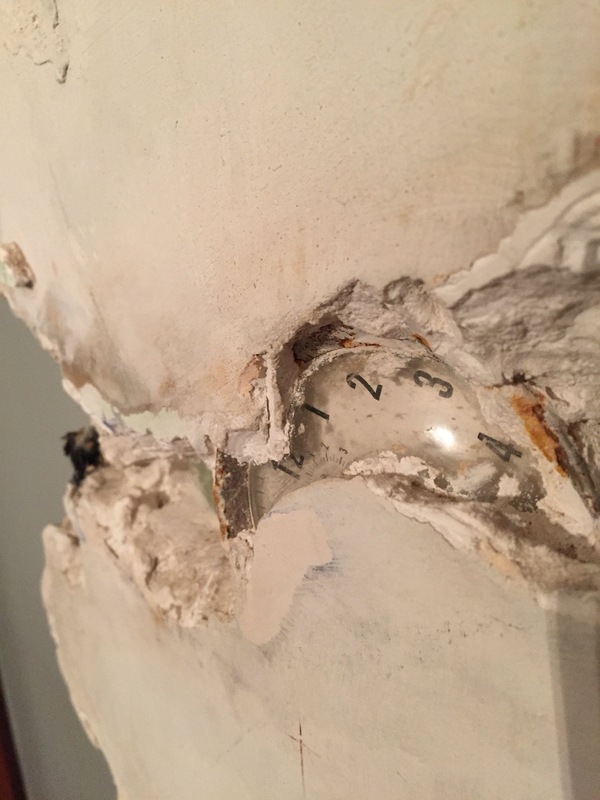 I see them as a study of our culture through what’s been left behind… Bits of rubbish, a clock, remnants of polite society mixed with cigarettes and bouncy balls, as if fossilized. No matter what, it has stirred up conversation and that is the purpose of art. Art should make you want to reach out and touch it. Art with form and dimension will spice up your flat wall and cast shadows, playing on the light. Over time I have developed this knack for adding texture. Cutting boards and pots, a sculptural and useful display in the kitchen, wed form with function and bring the idea of texture in. 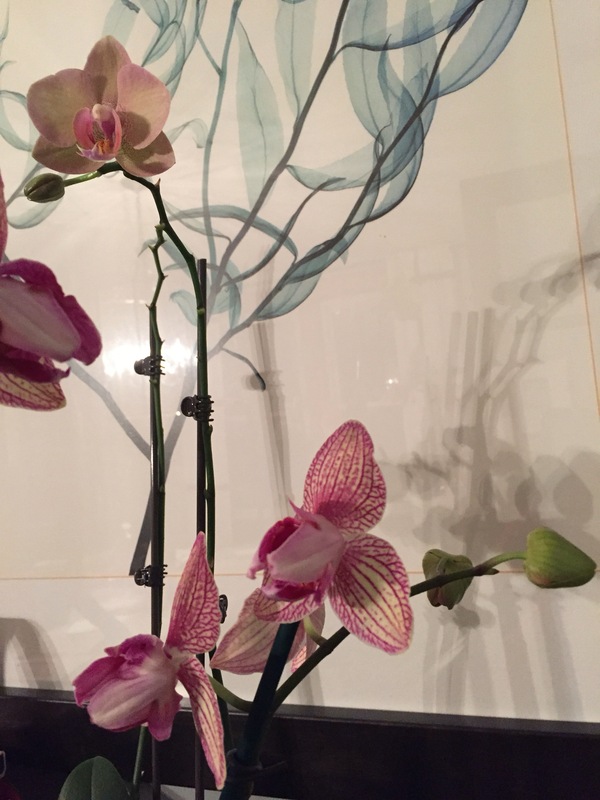 Breathe some life into your room by using this simple idea of texture in your space and see what you think. I know you’re going to love it. © copyright Mariam d’Eustachio at Simply Turquoise. Meet my husband’s alter ego, Stuart Martha. He comes and goes like a sporadic houseguest and at odd hours of the day and night. He brings me garnished drinks, and occasionally utters a brilliant design-related suggestion. It usually takes a few days for me to process it, but generally Stuart provides sound advice. When I start a project and get in over my head, Stuart comes to the rescue. 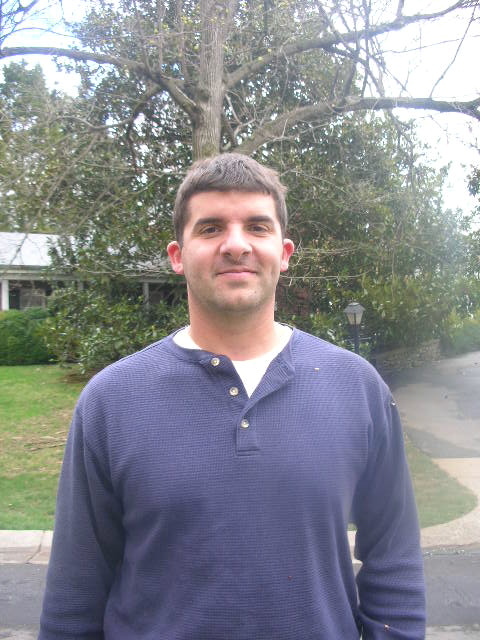 He is chivalrous, kind, charming, and is capable of embracing the feminine side of my husband’s personality. I love everything about Stuart Martha. Once in a blue moon, Stuart and I will have an argument. He does not like flimsy furniture whose beauty lacks function and he does not like to feel crowded in his space. I have to negotiate with Stuart, or nag him until he gives in. This was the case with our dining room table. Dining room table pictured in our house in Corpus Christi, Texas. Our dining room table was the first significant piece of furniture we ever bought. It was not a cast-off or picked up off the side of the road. When I found it, I was sure I had to have it. We were scraping by and it was tax season. Whatever should we do with that beefy refund? My husband suggested the reasonable and logical path of paying off debts. But where is the fun in that? I wanted this table even though it had no chairs to go with it. 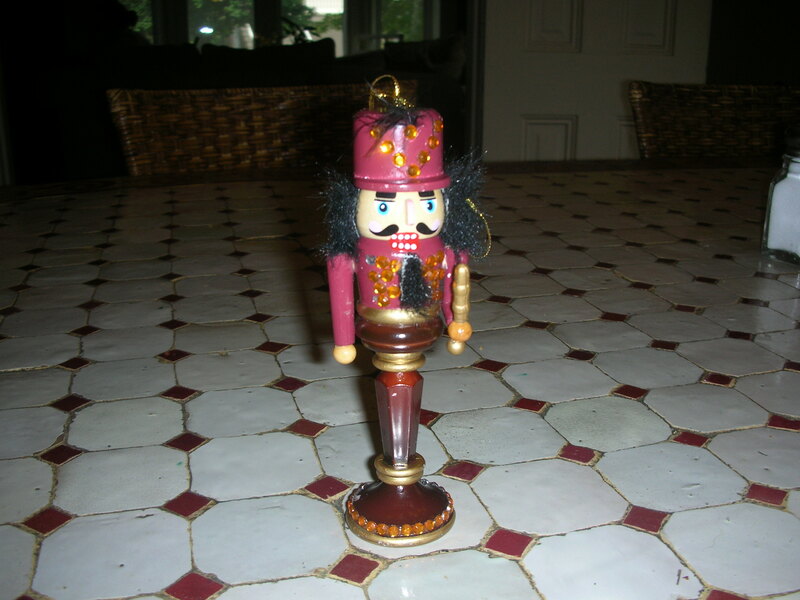 Portrait of a Nutcracker. By Secondo. It took less negotiating to end the Korean War than it did to purchase this table. In the end, we both agree that it is a fantastic table. The kids can paint on it, play on it, I can set hot things directly on it, and it never gets water rings. The only drawback is that it weighs about 400 pounds because it is made of concrete and moving it is no fun. 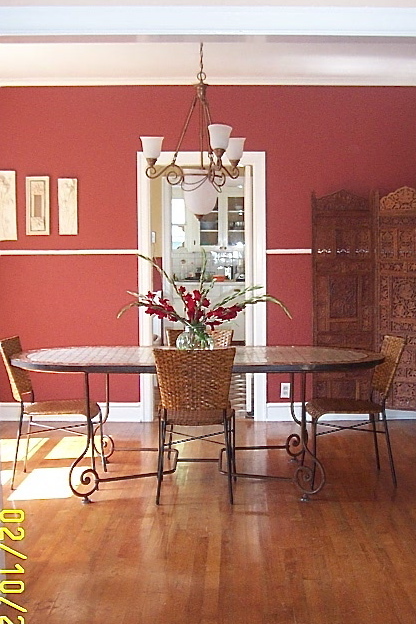 Dining room table pictured in Lynchburg, Virginia. The result of this argument over our dining room table is that usually at tax time, I get to splurge on one thing. It is our compromise. We end up splitting the baby, half for frivolous desires (usually mine) and the other toward our responsibilities. 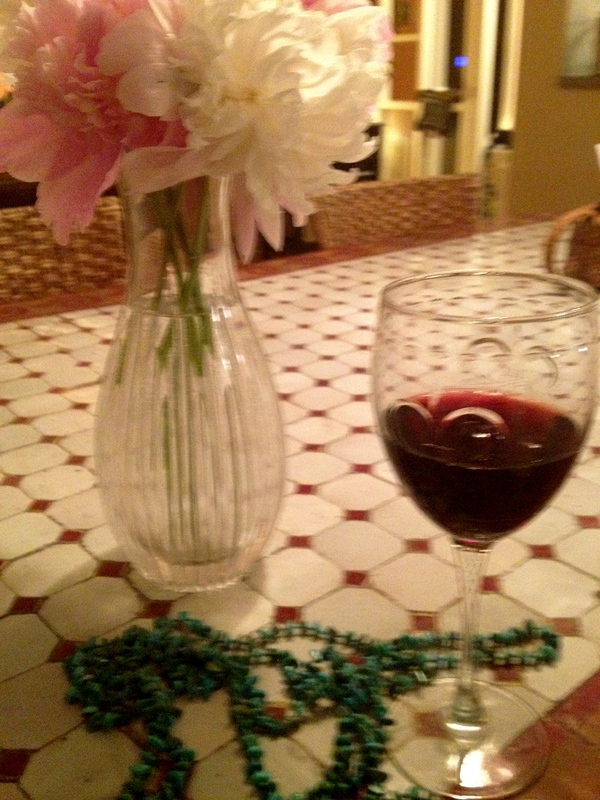 And now the story of this table has evolved. It has travelled with us through thick and thin. And even though it has caused much pain and suffering to every military moving company that has laid eyes on it, it has history. Our history. 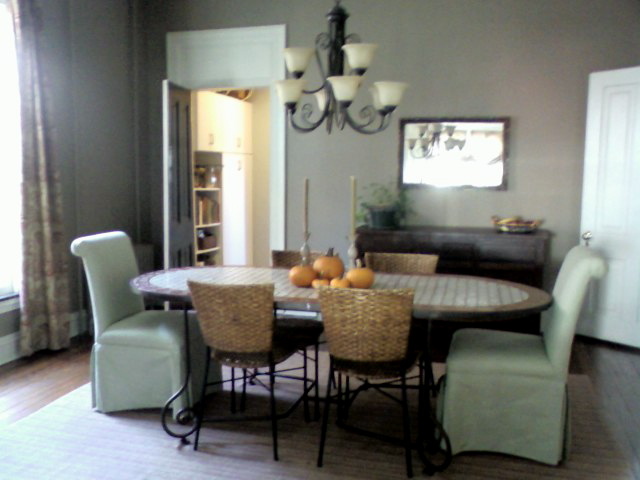 Now, this table is at the center of my home witnessing meals and friendship, family and crafts, and games with friends. I am thankful that Stuart has shared it all with me. 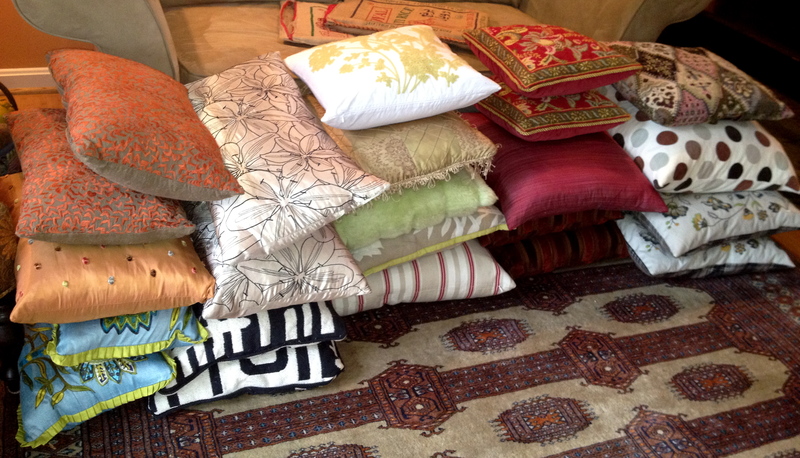 One of the easiest ways to freshen up tired old furniture, or brighten up any room in the house, is with pillows. Pillows are like candy for your room. They range from inexpensive to luxurious, hand-woven to graphic, and can punch things up. 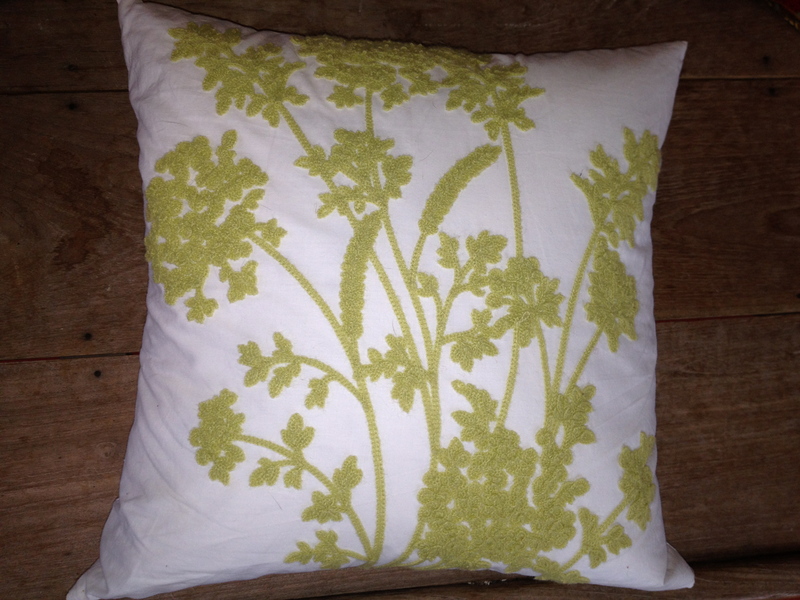 It is hard to mess up with pillows, and you can experiment here and have some fun. 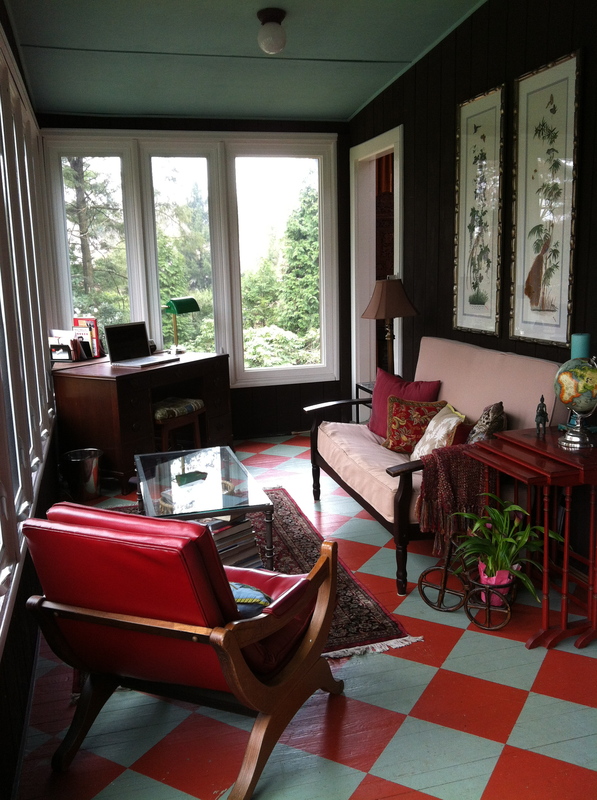 This is a place where you can add texture, bold pattern or color that you might shy away from otherwise. 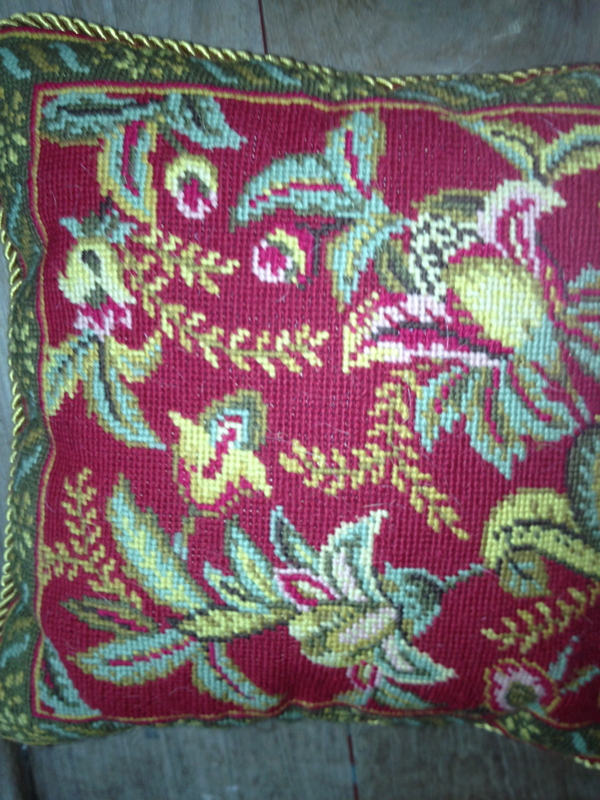 Or, if you have an underlying addiction to textiles like me, display it here. Needlepoint and embroidery, hand-woven or quilted, ruffles, tassles or braided cords and trim; the sky is the limit. A designer friend once dished out this little tidbit that I have never forgotten: Buy neutral furniture and you will not tire of it. 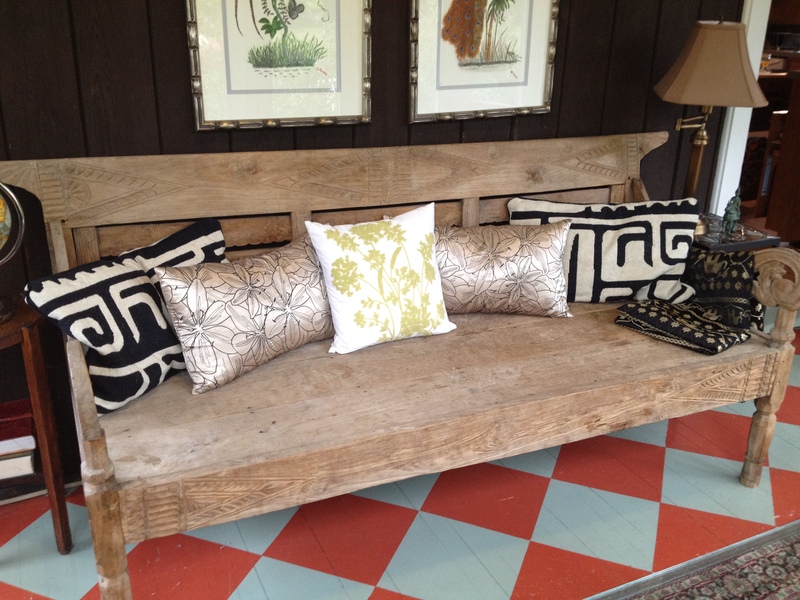 Change the cheap things like paint and pillows and your furniture will have staying power. So simple and smart. 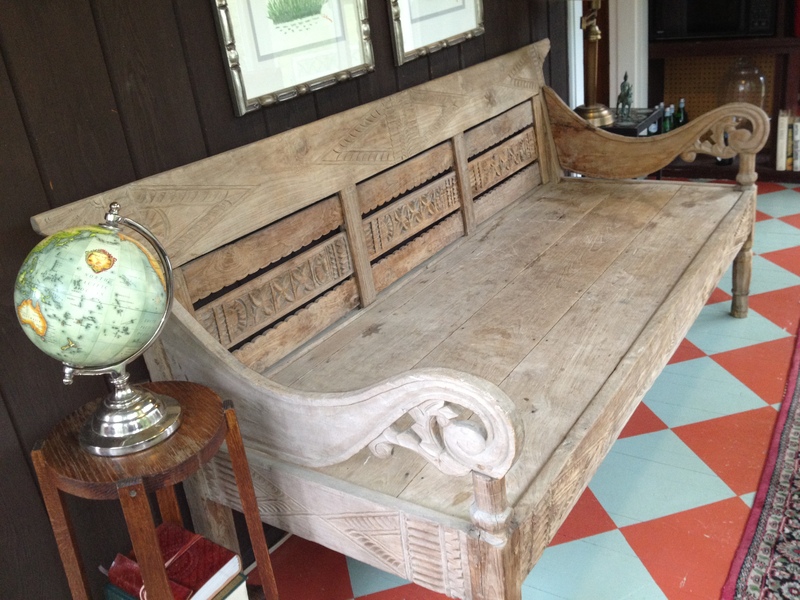 I recently bought this big, old wooden bench from a yard sale. It is carved and, well, . . . hard. It was a good find and I instantly thought, “this is my chance to show off all the pillows!” Even still, I have to sew a cushion for the seat. It is on my to-do list, right after “get sewing machine back from my sister.” Either that, or it has just been added to HER to-do list. I am not sure which. I am going to reveal to you the depths of my pillow problem. I stacked them up on the living room floor and…. These are my choices for the bench. 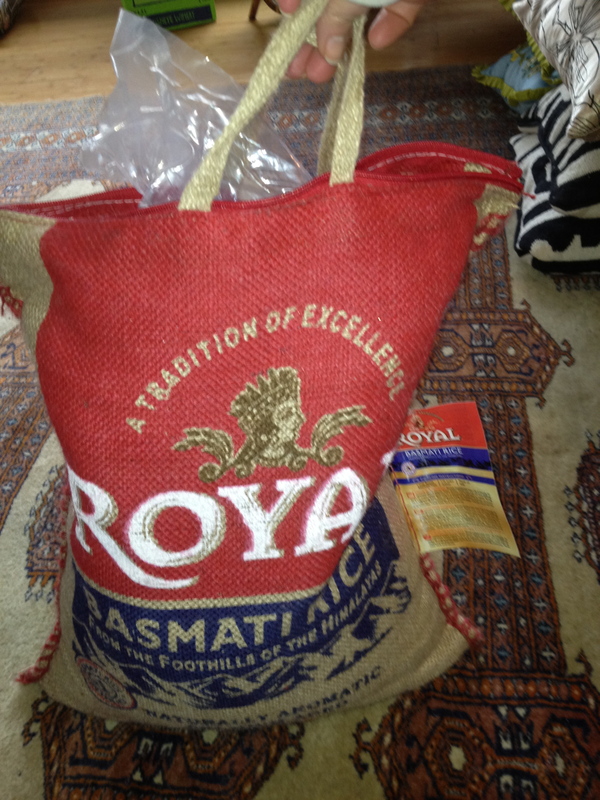 I also love the burlap bag look and so I bought rice from Costco and shoved an old pillow inside the bag it comes in. Cut off the tags and handles and it is instant art. Technically, if you eat the rice, it is also free. 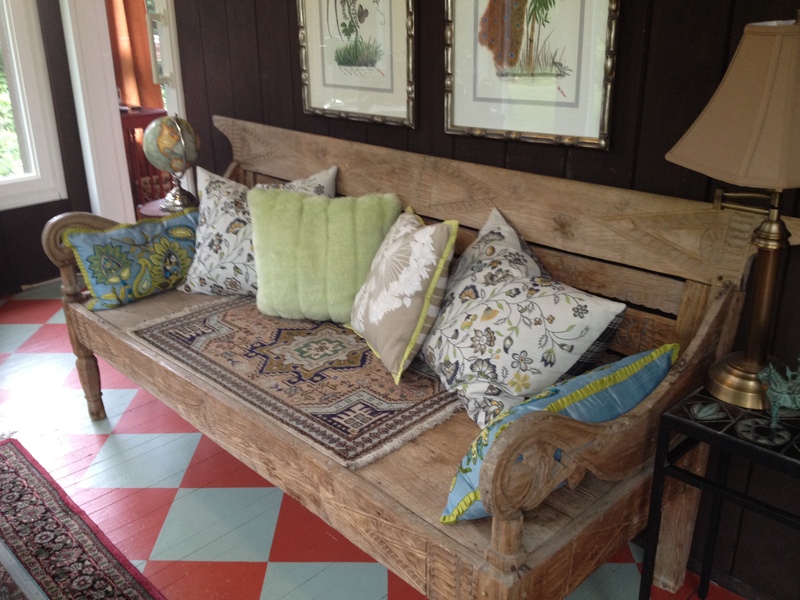 A little rug and some turquoise pillows. Traditional look with rice bags for pillowcases. My pillows are generally down or feather-filled for maximum comfort. Changing the covers is easy and there is so much room for creativity. 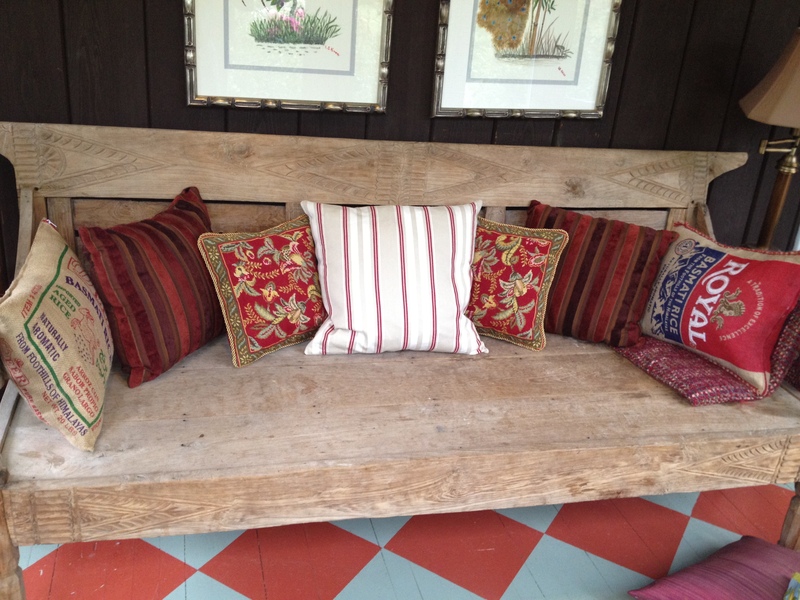 Spice up your space and go a little pillow crazy. You won’t regret it. 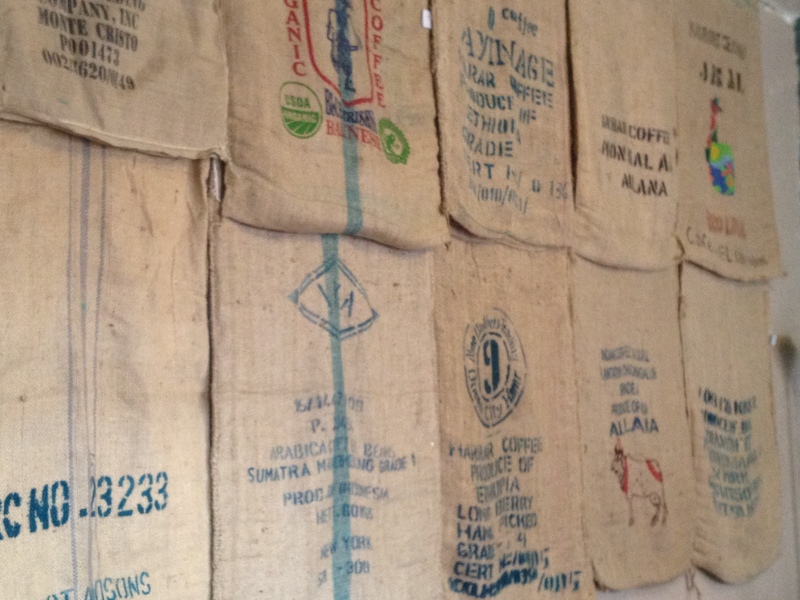 Wall of Coffee, The White Hart, Lynchburg. I like to hang things from the ceiling. 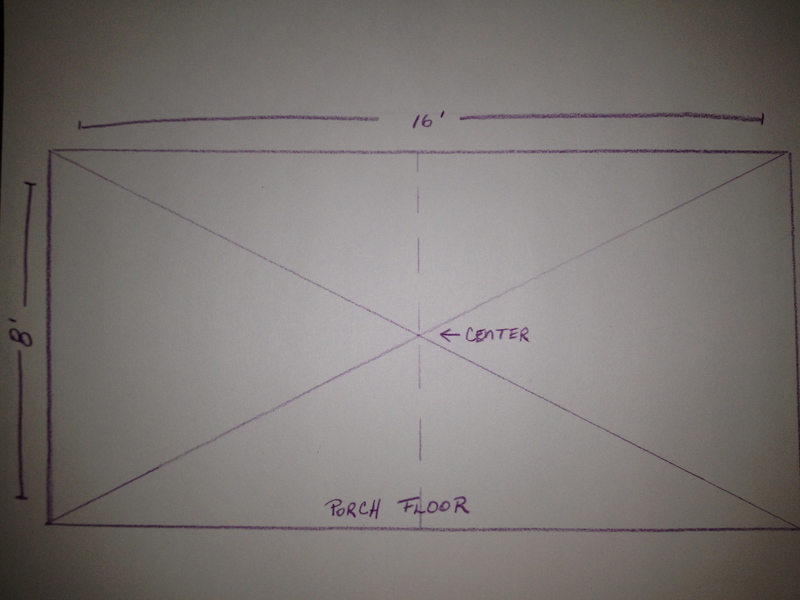 I use the vertical space in my house as a way to stretch out the floor plan. My ceilings are high, and using the vertical space draws the eye up and makes the room feel bigger. It is practical as well, adding storage while keeping the surfaces and floor clear of clutter. This area is the third dimension in your design and you can take advantage of this space. 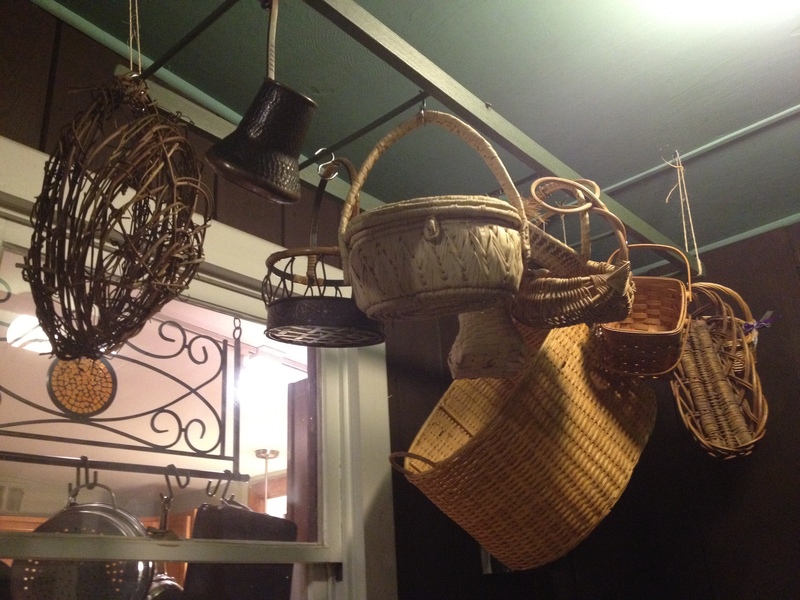 I searched high and low for a wooden ladder I could use as a basket rack. I eventually found a rickety one in a consignment shop. 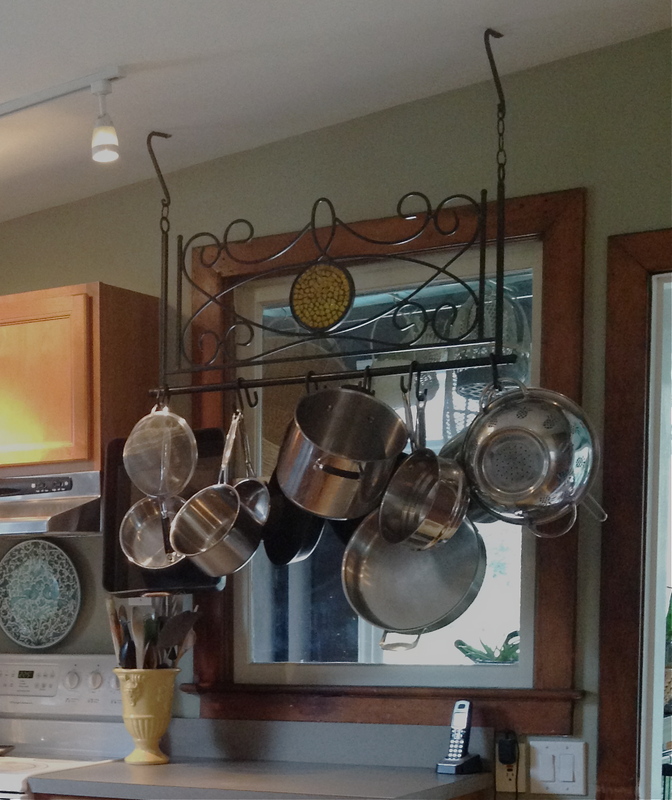 I hung the ladder from the ceiling with twine, added stainless steel S hooks to the rungs on the ladder, and hung the baskets on the hooks. 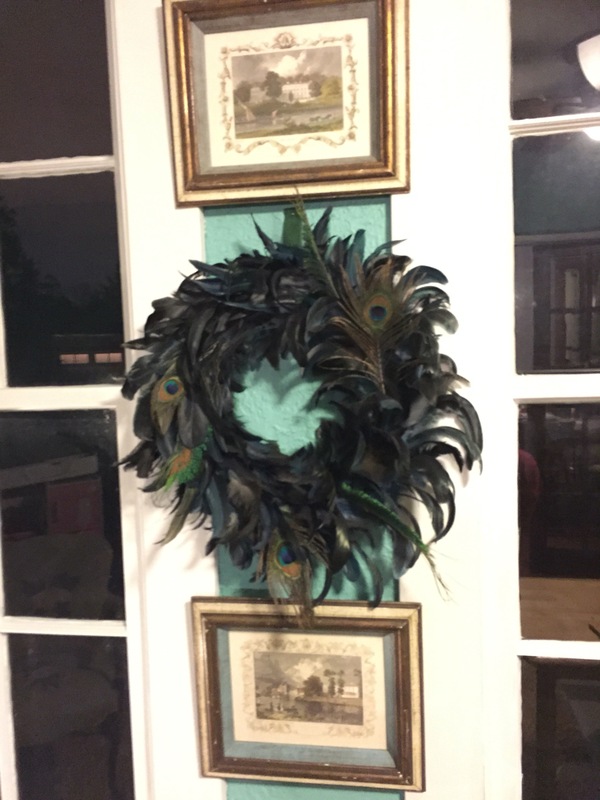 It is a space-saving solution that adds a hint of country charm inside my back door. 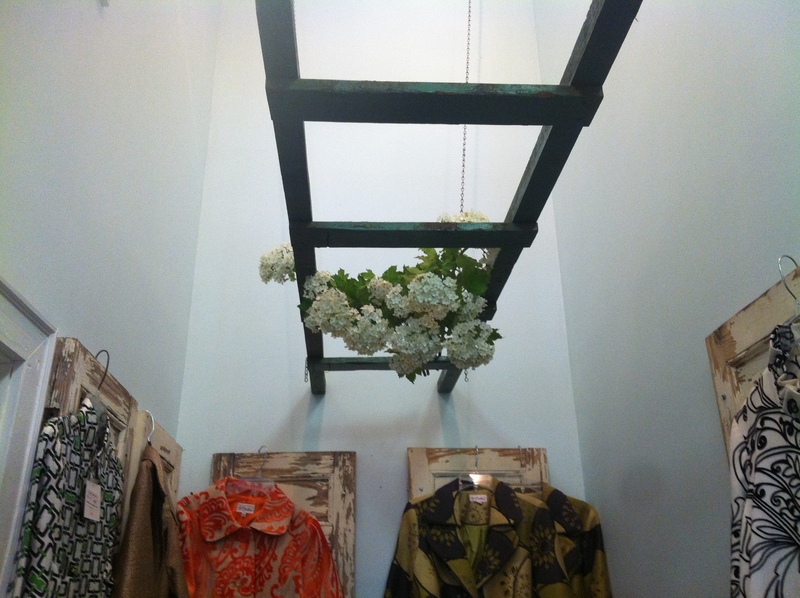 Ladder love: The Urban Merchant, Lynchburg. Alexander Calder invented the mobile. He tinkered with wire and bits of this and that until he had made a hanging creation. What a fabulous way to bring art into your vertical space. You can hang an abstract mobile from the ceiling and bring 3-dimensional art, reflecting light or color, into your room. 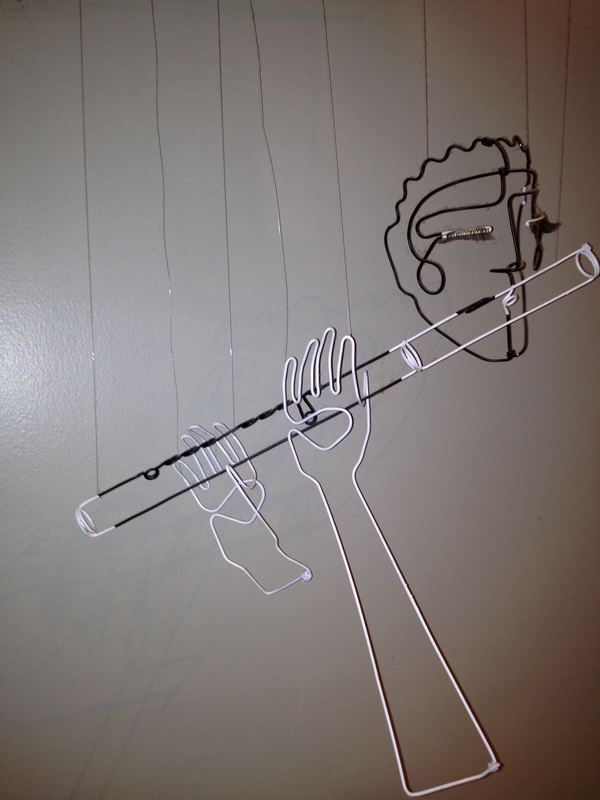 I have a wire sculpture that I call the “flute lady” that hangs from my ceiling. I added the eyelashes (at the gift-giver’s specific instruction) to make her look more like me. It is music and art wrapped up together in a portrait and I love it. Utilize your vertical space. Think outside the box and draw your eyes up. 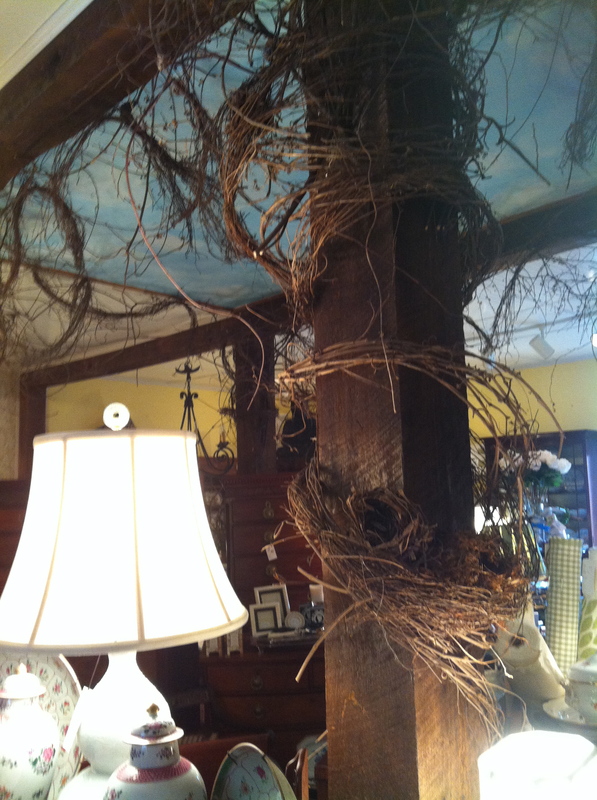 Vines twisting up the column, Enchanted Antiques, Lynchburg. 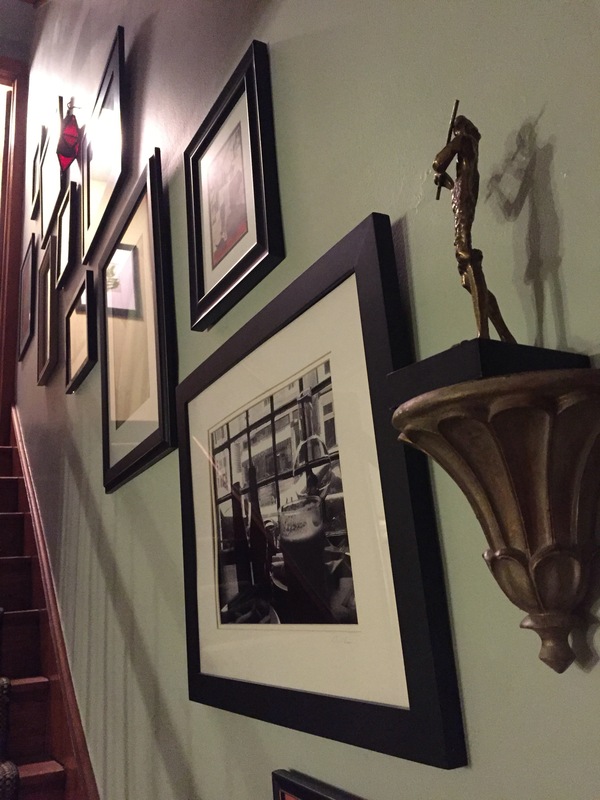 What can you do to add the illusion of height to your space? © copyright 2012 Mariam d’Eustachio. All rights reserved. I have always loved books. I once read that you burn more calories reading a book than watching television. Perhaps because your brain is so active imagining all the possibilities while you are reading. Or maybe your brain is just busy digesting information, whether it is fiction or not. I love to read and I cannot get rid of a book. When I walk into a home full of books, I know that I will connect with the inhabitants. 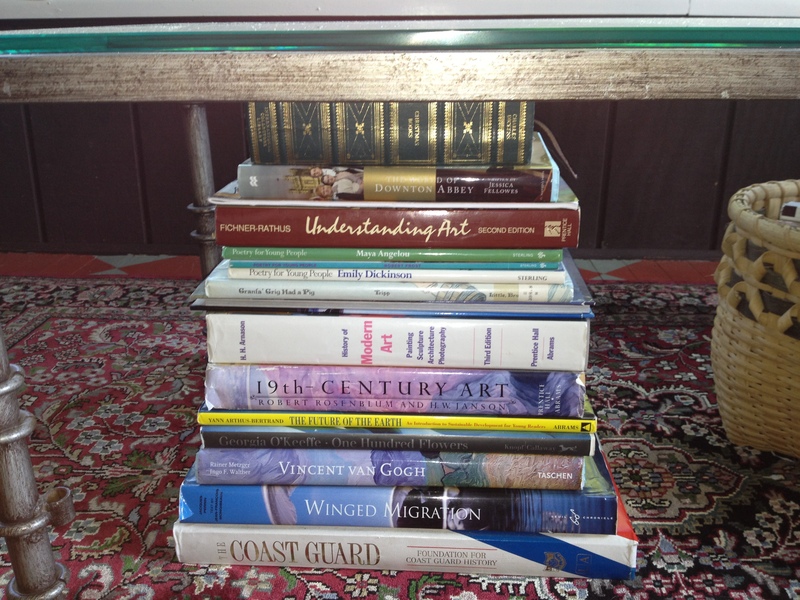 I love to see what people have on their bookshelves or on their coffee table. It is a glimpse into their world and gives me an idea of who they are. Maybe I am prejudging them, casing the joint, performing some sort of bookworm profiling. Books say a lot about people, and I am fascinated by this. This presents a practical issue when decorating. Where do you put all of those books? 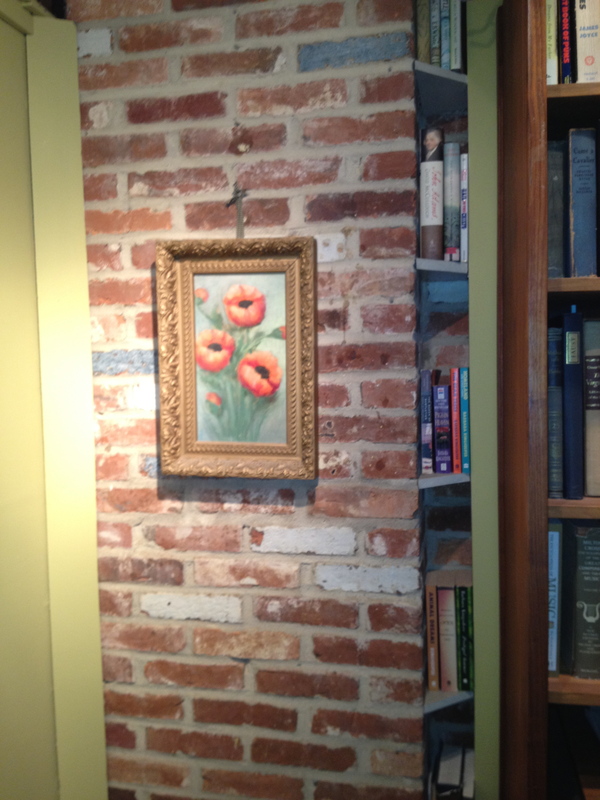 I have books tucked away in every nook and cranny of this house. They are stuffed in cabinets, stacked under the coffee table and piled up on nightstands. 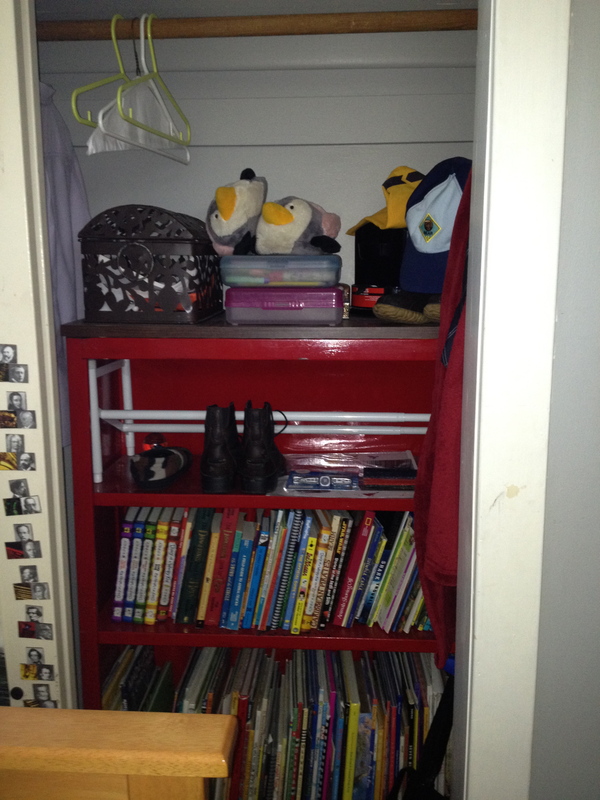 Inside of the closets you are more likely to find books than clothes. 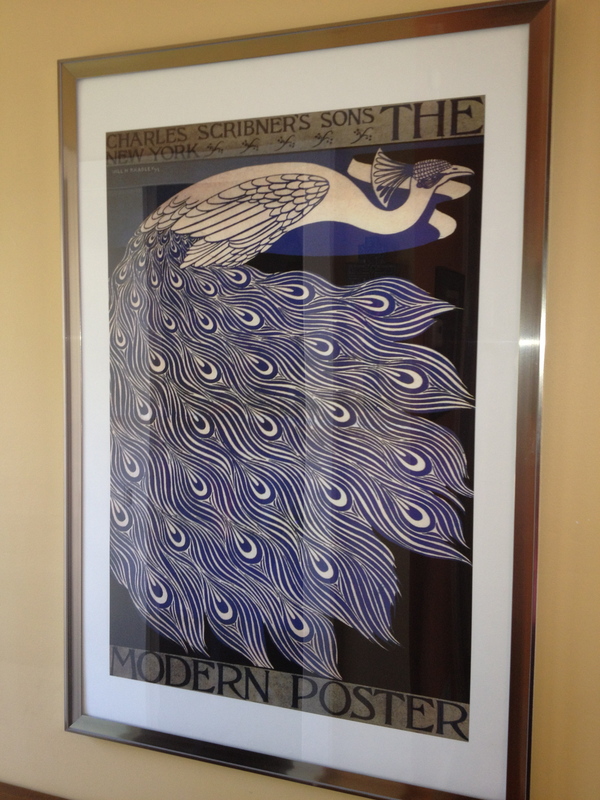 I recently found this incredible poster from Charles Scribner publishing. 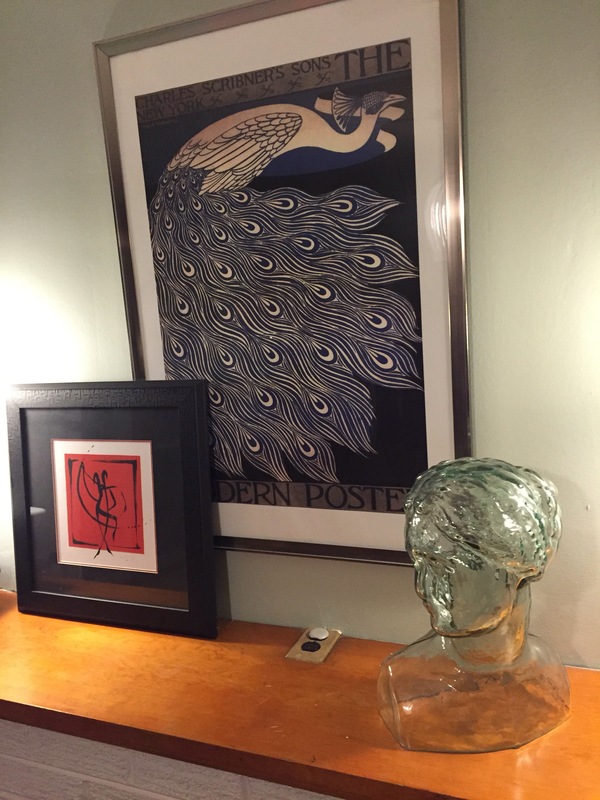 It combines several things I love: peacocks, books, and art, all in one. 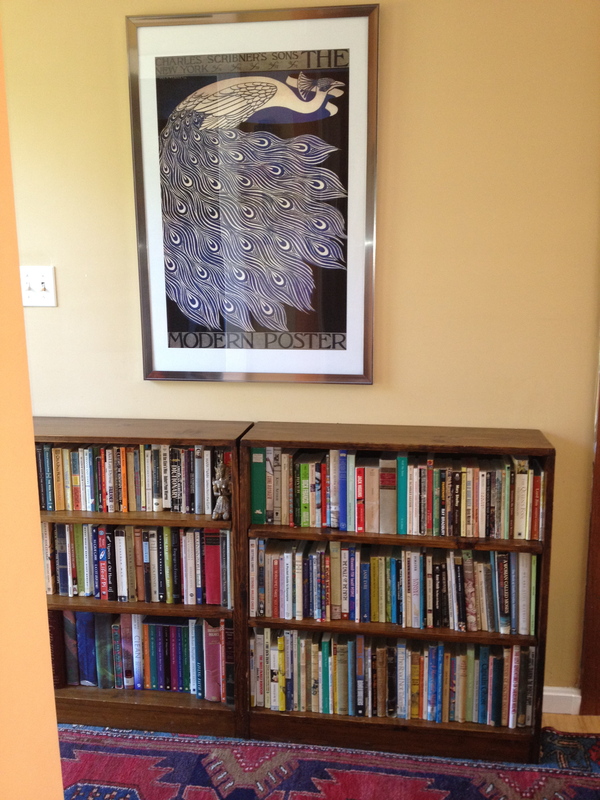 I decided to hang it over my bookshelves in the foyer. I love the uncluttered look of the poster above the clutter of all those books. It is perfect and inspires me. There is a movement afoot in the decorating world to fill shelves with knick-knacks, pottery, art, or anything else but books. I have even seen them covering the spines with paper so they all match. I find this offends my inner intellectual. I think books should have a place in the world of design and it should be a place of honor. 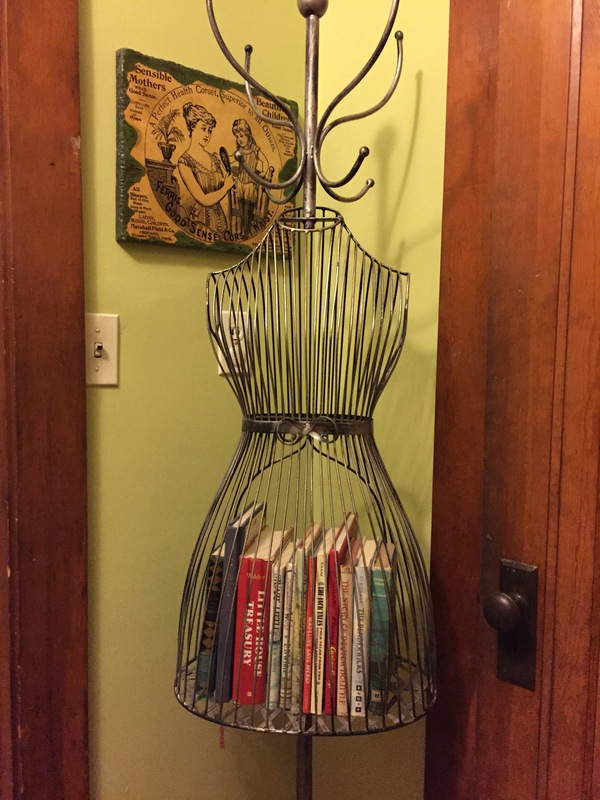 Add other things with the books to create interest on your shelves, paint the back of the shelf a fabulous color, and let the books tell the story about who you are, for the nosy bookworms out there like me. Sometimes math provides clarity. When I am surrounded by chaos, I find myself enjoying paying the bills. Something about the order of it all and how numbers always make sense. They are low maintenance and low drama. I love numbers. I have a strange ability to recite numbers in order, forwards or backwards. This was only discovered when I was poor and willing to do just about anything for money while in college. With electrodes strapped to my head, the NIH researchers studying my brain said, “Wow! You are not normal.” This was meant, I think, as a compliment. Talk about skills you have no idea what to do with. You may be wondering what this has to do with design, but I promise you, it does. I find I have to use math frequently. 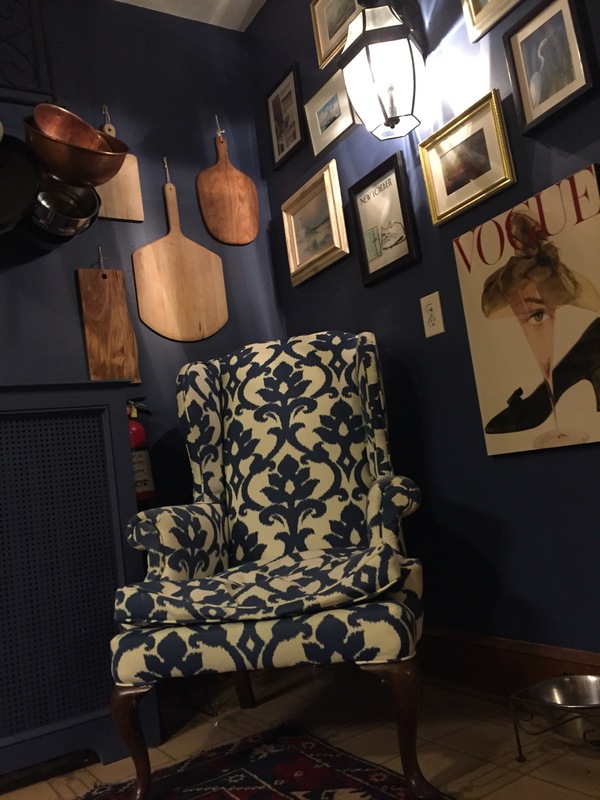 For example: when tiling a floor or backsplash, painting stripes on a wall, judging the scale of furniture or accessories to place in a room, or when painting a checkerboard floor, geometry abounds. This is a lesson in geometry. 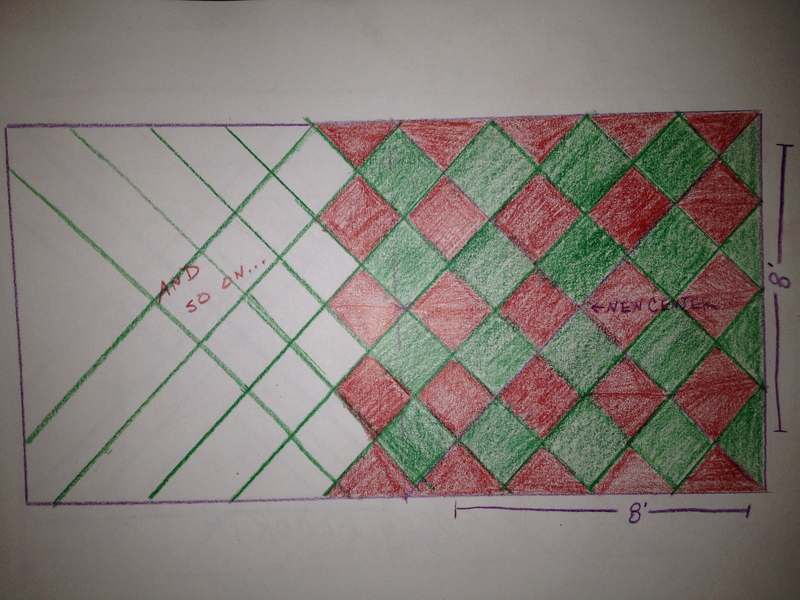 If only my high school math teacher had used design to teach, I would have been a star student! With a few simple tools, some floor paint, and at least one crisis you are trying to avoid in your life, you too can do it. You will get into a math zone, I think similar to the runner’s high I know nothing about, and everything will come into focus. First, prime and prep the floor. Make sure it is smooth and ready to receive paint. Use a good quality floor paint (I prefer Benjamin Moore). Then paint the entire floor, with a roller, the base color. I painted the floor green first. Now for the math: find and mark the center of the room. In my case the room was not square, so I divided it into two imaginary rooms and marked the center of each section, which was about 8 x 8. 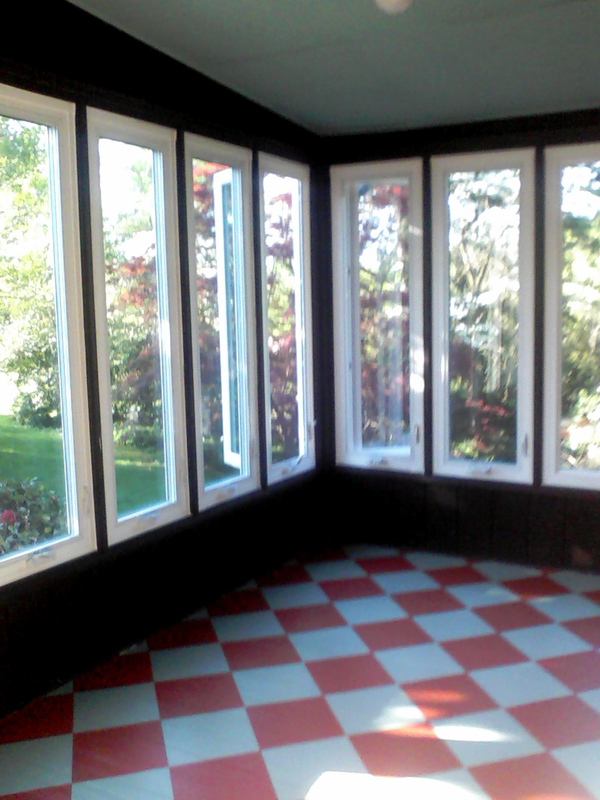 This made it so the checkers were square and not elongated like the shape of my room. Then draw a line, with a yardstick as a straight edge, from one corner to the other, going through the center mark and creating an X. Moving from the center towards the edge of the room, draw parallel lines to the center line. You will get a checkerboard all the way to the edges. Find the center of your room. Now divide your room into a square and mark the center of the square. 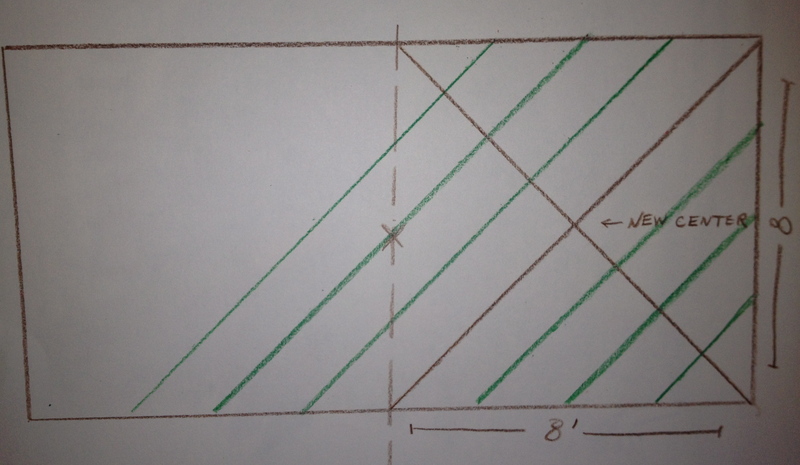 Draw parallel lines to the center lines for the square. Voilà! A checkerboard pattern. Using frog tape, tape off the squares along the outside of the pencil mark so you don’t have to erase any marks. With a tapered PURDY brush (please do not attempt to use any other type of brush to paint) fill in the opposite squares with your contrasting color. Now comes the zone part: continue to paint until your knees hurt. Or you can use one of those garden pads. sore knees + math = awesome floor.